After our June wedding in Southern Ohio, my husband and I embarked on the honeymoon of our dreams. I will admit it did not start out very glamorous. We left Cincinnati on June 9th bound for Los Angeles, where had five hours to kill at LAX before our flight for Papeete, Tahiti would depart. We were very fortunate to receive seats in an exit row that provided comfortable leg room for the nearly nine hour flight. The Air Tahiti Nui flight staff was extraordinarily friendly. Upon arrival in Papeete (pronounced by islanders as Pa-pee-e-tee) we were efficiently shuffled through customs and clearly directed toward our next flight. Our third and final flight would only last six minutes, and leave us at our final destination, the island of Moorea. We chose French Polynesia as our honeymoon destination because we really wanted to do something that was unique, romantic, and relaxing... and this seemed to fit the bill. We worked with our local travel agency to assist us in finding an affordable way to make this dream honeymoon a reality. 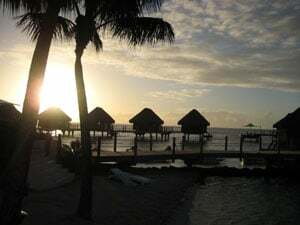 After one meeting, and many emails with our travel agent, we finally decided on the island of Moorea, as opposed to the nearby, and much pricier Bora Bora, and The Pearl Resort. We also decided on a beach bungalow, which was about half the cost of an over water bungalow. The Pearl was smaller and more intimate, while just as gorgeous and luxurious of the other resorts on the island. 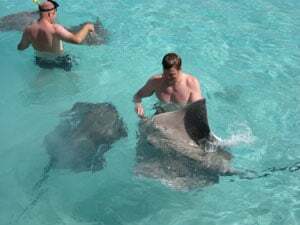 We had the chance to visit most of the other resorts on the island, either for an excursion like swimming with the dolphins, or simply dropping people off coming or going from other excursions, and we were still very pleased with our resort selection. If we are lucky enough to go back again, we would stay at The Pearl. Since we saved money on island choice and bungalow location, we were able to stay on Moorea for 10 days - which was absolutely perfect. There were other people that got there the same day as us that we saw leaving after a week, and we were definitely not ready to go yet, but after a few more days, leaving was easier. We had time to have full days of relaxing, and full days of sightseeing. 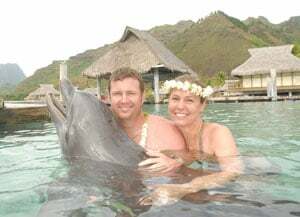 Our favorite activity on our dream honeymoon, thanks to our Traveler's Joy, was swimming with the dolphins. This was definitely an experience that neither of us will ever forget, and something that our budget definitely would not have allowed without our friends and families generous gifts through our registry. We also enjoyed exploring the island on a scooter for a day, an all day lagoon tour, and a 4x4 adventure of the mountains and the farmlands on the island. The trip cost us around $8,000 for the booking (hotel, airfare, & airport transportation - close to half of which was airfare alone) and we spent around $3000 while we were there, nearly all of which was covered by our Traveler's Joy honeymoon registry. We arrived back in Cincinnati on June 20th and there is no doubt that we would recommend this trip to honeymooners. It is the epitome of romance and relaxation. Although we both thought this would be a once in a lifetime trip, we are already talking about how long until we go back!